SYNOPSIS: One of the wildest martial arts / fantasy / magic / action mash-ups you'll ever see. A distraught couple are chased into the snowy mountains by an evil ruler named Devil, some red-suited ninjas and a guy with a green vampire werewolf rubber mask face. In a desperate attempt to save their newborn child they cause an avalanche which kills them both but saves the baby. A pack of wolves (German Shepherds actually!) take the orphan into their icy "Fortress of Solitude"-style lair and raise her for the next 20+ years as their own. They teach her the ways of the wolf and turn her into a fierce fighter. 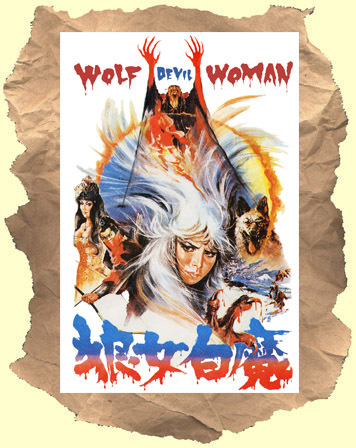 Two explorers discover Wolf Devil Woman and she is soon brought back to civilization where she learns of her true origin and once again meets Devil and his minions. With her new wolf-ninja skills she's able to exact violent revenge. Lots of action, blood, high-flying wire work and over-the-top voice dubbing. Pretty amazing. Dubbed into English.